There are few dishes that can represent an entire cuisine. Pizza is one of those meals that can easily stand on its own. In KCK, there are a variety of pizza shops, but 1889 Pizza Napoletana stands out from the crowd by delivering classic pies to its customers. We’ve had the chance to visit previously, but with eats this good, we were happy to make a return. It was a cold day, and we couldn’t wait to get inside, since we knew it would be nice and toasty. You may wonder how the restaurant got its name, because we certainly did. According to legend, pizza was first created in 1889, in Naples, Italy. We want to thank Visit KCK and 1889 Pizza for their hospitality. Rest assured all opinions are our own. These original pies were made with simple ingredients and cooked with a wood-burning oven. Husband and wife owners, Jason and Kelli Kolich, have a passion to bring this original taste to their customers. During this visit, we learned more about pizza making than we ever believed we would. It all begins with the crust. Now like most, we thought it was just flour, yeast, and water. What we discovered was that there are a lot of flour options, but the gold standard for pizza is Caputo flour. It is finely ground and has a lower gluten content. The dough is stretched gently to prevent overworking it. The differences at 1889 Pizza doesn’t stop with the crust. One of the staff members (Roberto) is from Italy, and was happy to give me some pointers on perfect pizza making. A key to getting it right is the cooking method. Using a copper coated wood-burning oven, the idea is to use extremely high temperatures to shorten the cooking time. Roberto stoked the fire with fresh fuel, and soon the oven was screaming hot at around 1000 degrees. With that much heat, their classic pies cook in just a couple of minutes. So what did all of this prep time get us? The pizza our Italian friend created was for his lunch break. Once it was finished, which didn’t take long, it was time to slice it up. What happened next was truly inspiring. Much to our surprise, he offered us a couple of slices of his lunch. He reassured us that there was plenty to go around, so we happily accepted his offer. His Margherita Pie was a classic, but filled with amazing flavor. The slices were everything we had hoped for, but only whet our appetites for more. Now it was time for us to pick. Customers are free to build their own pies, using a wide variety of toppings. While this allows for almost limitless combinations, we decided to pick from one of their ten pre-planned creations. So what would we be in the mood for today? Savory? Spicy? It turns out the one that caught our attention was Honey Bee. A tantalizing mixture of freshly sliced pear, Gorgonzola cheese, arugula, and local honey blend sweet and tangy in each bite. And that crust was so soft and chewy, yet had a little char to kick up the flavor level. You can bet this pie didn’t have a chance of becoming leftovers. 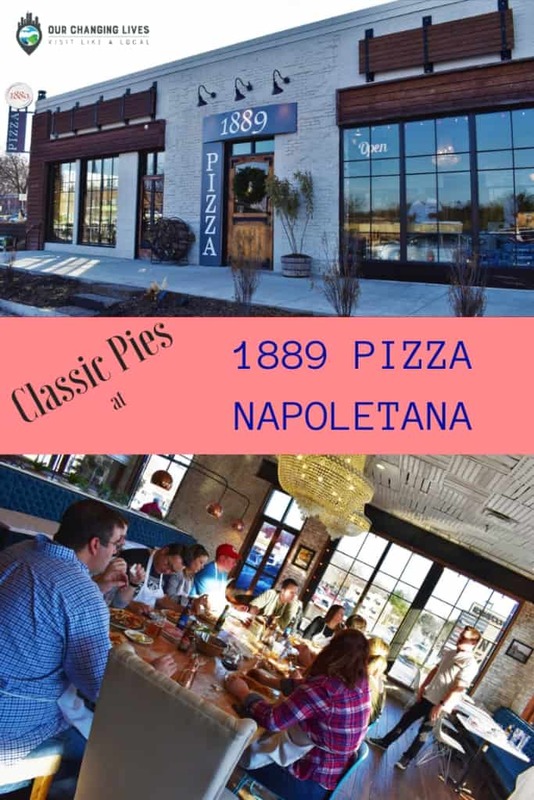 As you see, 1889 Pizza Napoletana sets itself apart from the crowd with their classic pies. Of course, there are other ways that they rise above. If you are in a hurry, they can get you in and out quickly, with a fresh pie in your hand. For those wanting to slow down a bit, dine in and pair your pizza with a glass of wine. Looking for something even more engaging? 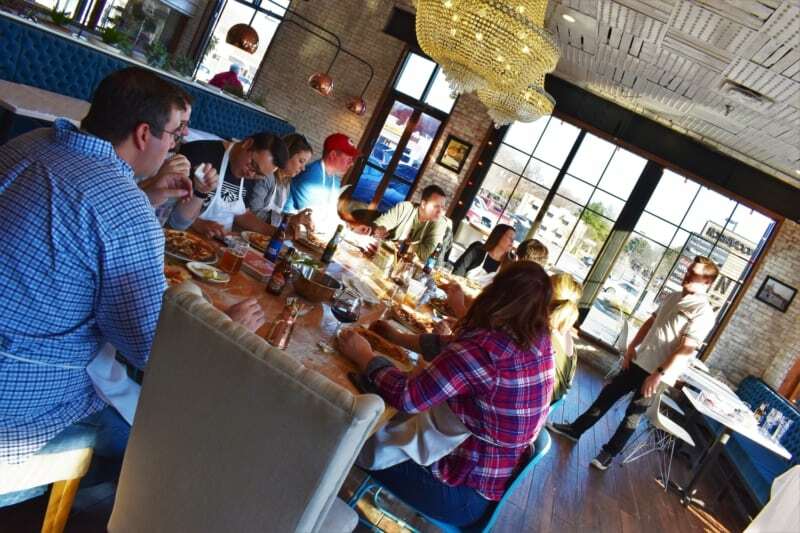 How about a pizza making class for you and some friends? This is just one of the special classes that they offer at 1889 Pizza. During our visit, we noticed a group who were enjoying the fruits of their labors, as they wrapped up their pie making class. Everyone was smiling, laughing, and devouring their just rewards. Wouldn’t that make for an excellent alternative birthday party? You can visit their website for details. Share with the friends you’d make pizzas with!